Ion exchange (IE) is a water treatment method used to remove unwanted dissolved impurities from water and other liquid solutions. The process by which this is accomplished is through the exchange of ions from the contaminant with the ions from a desirable substance. These ions contain a positive electrical charge called a cation or a negative charge called an anion. The ions exchanged must be have the same type (+ or -) of electrical charge in order to maintain the neutral charge of the water. Ions are typically formed when a contaminant dissolves in water. When dissolved substances are in the water it will still appear as crystal clear. On the other hand, if the contaminants are solid particles the water will be cloudy. Solid substances can be removed from the water by a variety of filtering methodologies. These solid particles must first be removed from the water before replacing the dissolved ones through ion exchange. A common use of ion exchange is in softening of water. Hard water primarily contains dissolved calcium and magnesium ions. These ions can precipitate and cause scaling in water pipes and plant boilers and if not removed can lead to system damage. To soften water, we would exchange the hard cation ions (Calcium Ca++ and Magnesium Mg++) for another cation that will not lead to scale formation. 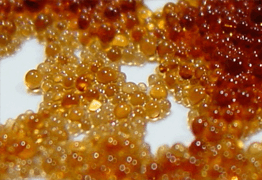 The process involves use of exchange resin beads that have been charged with sodium (Na+). The system would pass the hard ions (Ca++ and Mg++) through the resin beads which would replace these cations with two sodium ions. Each calcium or magnesium ion that enters the resin bead would be exchanged with two sodium ions leaving the bead. Anion ions cannot enter the resin bead as the bead also contains a permanent sulphonate (SO3-) anion that repels the positive water ion. The exchange takes place due to the resin bead preferring calcium and magnesium over sodium. The end result is a replacement of the hard ions by sodium ions although the salinity of the water remains unchanged. It is only the constituents of the salinity in the water that is altered during the softening or ion exchange process. Its imortant to note, if desired, the hard ions can also be exchanged for potassium in combination with or a replacement for sodium ions. The net result of this exchange is a complete removal of the ionic contaminants. The ionic contaminants will be attached to the two exchange resins and the water will have been completely demineralized.